Christmas is Christmas no matter how far! Dawn breaks on Christmas morning. Children huddle excitedly in the hall. Mom and Dad are getting up slowly, enjoying their children’s overwhelming anticipation while struggling to get coffee. The family moves into the main room, with a tall, live, green Christmas tree covered with bright colored lights. The tree is surrounded by presents. Some are wrapped in bright paper, while others are placed in several stacks, still unwrapped. The wrapped presents are those from Mom and Dad and the family; the unwrapped ones have been brought by Santa Claus in the deep of the night. The next hour or more is spent unwrapping presents. The air is filled with excitement and laughter — the joy of Christmas morning. This scene, or one similar, is the archetypical American vision of Christmas morning. We know it from stories, classic holiday movies, television, and our own Christmases. The family is gathered, the presents are opened, and later in the day everyone will feast on turkey and ham and myriads of side dishes. This is what most Americans envision when we hear “Christmas morning,” even if our own personal experiences might have differed somewhat. Though Christmas came with settlers to the Americas from Europe, we might be surprised to learn how different the actual traditions concerning the Christmas season have developed the world over. Christmas Day is pretty obvious – December 25th. Except that in some places, much of what we Americans associate with Christmas Day celebrations is done on other days! In Germany, for example, the big celebration day is December 24th. This is the day the children open their presents, carols are sung, and the traditional Christmas dinner is eaten. The celebrations then extend through the 25th and 26th as well, with extended family exchanging gifts, visiting, feasting, and children enjoying their new toys. Interestingly enough, quite a number of other countries have the main Christmas celebrations on the 24th, especially many places in Europe. Others vary the main celebration based on which cultural traditions a family prefers, such as Italians celebrating on either the 24th or 25th (though presents are still exchanged on the 25th). Christmas in Russia is celebrated on January 7th, which is December 25th according to the Julian calendar (the Julian calendar was reformed in the West in 1582 to the Gregorian calendar, which we use in the US). Russian children look forward to December 6th just as much as Christmas, because in Russia, that is the day of St. Nicholas, and he brings them gifts and chocolates, instead of on Christmas Day. Christmas Day the world over features food as a central component. Traditional foods and large meals are common, though perhaps nowhere more so than in Poland. 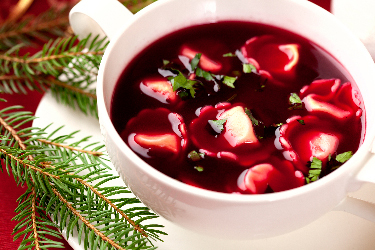 The traditional Christmas meal in Poland consists of 12 courses (in honor of the 12 Apostles), and includes such dishes as beet soup, carp (in multiple dishes), pierogi with sauerkraut, and cheesecake. The German Christmas dinner (served on the 24th) is typically simple, often potato salad and sausage. On the 25th, a more refined meal of goose, dumplings, and red cabbage is enjoyed, and everyone enjoys cookies and gingerbread throughout the holiday season. The Finnish enjoy mulled wine with their ham, lutefisk, reindeer, cheeses, and sweet bread. It’s fish (on the 24th) and chicken (on the 25th) for Italians, along with the world famous sweets pandoro and panettone. Of course, as with most things, each family interprets and adapts their national dishes, regardless of where in the world they may live. We are used to an array of Christmas decorations in the US — the Christmas tree, blinking lights, nativity scenes, candles, holly leaves, and poinsettias. Whereas decorations go up as early as November in America, that is not the case around the world. In Germany, some children will not see their tree until it’s time to go and see the presents on the 24th. The Christkind (Christ-child) sets up the tree, decorates, and brings gifts, all behind closed doors on the days before December 24th. Finnish families bring in the tree together on the 24th, decorating it together with wooden ornaments, candles, and homemade decorations. Italian children are also familiar with the Christmas tree, but the central decoration in Italy is the presepe, which is a nativity scene often made simply of wood or fired clay. Though dates and specifics vary, it seems most everyone likes festive decorations while celebrating the holidays. In America there is a yearly conversation on the true focus of the holiday — family, religious, personal, material. There is a saying in Italy: “Natale coni tuoi, Pasqua conchi vuio” (Christmas with your family, Easter with whom you want). This seems to encapsulate the attitude of many toward the Christmas holiday celebrations. It is a special time of year to be spent in the company of one’s family. 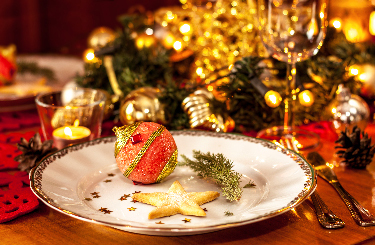 The most typical cycle worldwide is for the main Christmas feasting and present opening to take place with members of the immediate family, and for the days following to be spent visiting the extended family (and lots more eating). 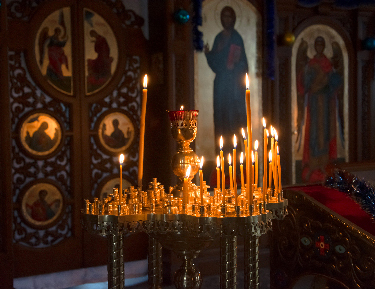 Most Western countries also have a large religious focus around Christmas, with services primarily being held on Christmas Eve and Christmas Day. A great deal of energy (and money) go into present buying and food, but in the end, time with loved ones garners the greatest attention and devotion from most. Our children’s favorite part of Christmas (and honestly, many adults as well) is the opening of gifts. American children are largely used to presents from both family and Santa Claus on the morning of the 25th. Not only are presents opened on other days in some places, they do not necessarily come from “Santa Claus.” In many European countries, like Germany and Poland, the presents are delivered to the children by the Christkind (Christ-child). Italian children will be visited by Babbo Natale (Father Christmas) or Gesù Bambino (Baby Jesus). The Finnish have a wonderful tradition where families actually bring in a Santa Claus to deliver presents. Usually played by a member of the family or a close friend, Santa enters through the front door on the 24th and asks “Are there kind children here?” After the children respond, the presents are passed out and Santa leaves. In older times the bringer of gifts was not even Santa, but rather the joulupukki (Christmas goat). In addition to those things we might consider ‘usual’ for Christmas, there are many traditions that various cultures hold dear. Almost universal is the singing of Christmas carols during the season’s celebrations. 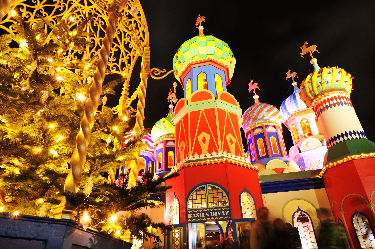 The Germans set up Christmas markets in every town during December, where people mingle and shop for both food and unique gifts. Christmas morning in Finland sometimes begins with a sauna, and the celebrations officially begin once the “Christmas Peace” is broadcast from the former capital of Turku. In Poland, there is a very specific celestial event that marks the beginning of the celebrations — the appearance of the first star in the night sky. 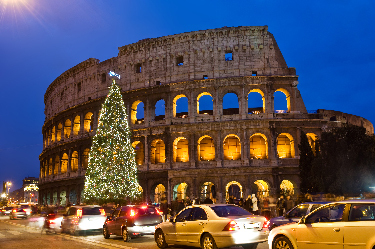 There are many, many other commemorations of the Christmas season around the world. Learning about some of the traditions practiced by other cultures can help us understand others better and also appreciate our own unique celebrations. We share a common bond as people celebrating Christmas, yet each doing it our own way, wherever we happen to live. Merry Christmas to all, wherever your home may be! 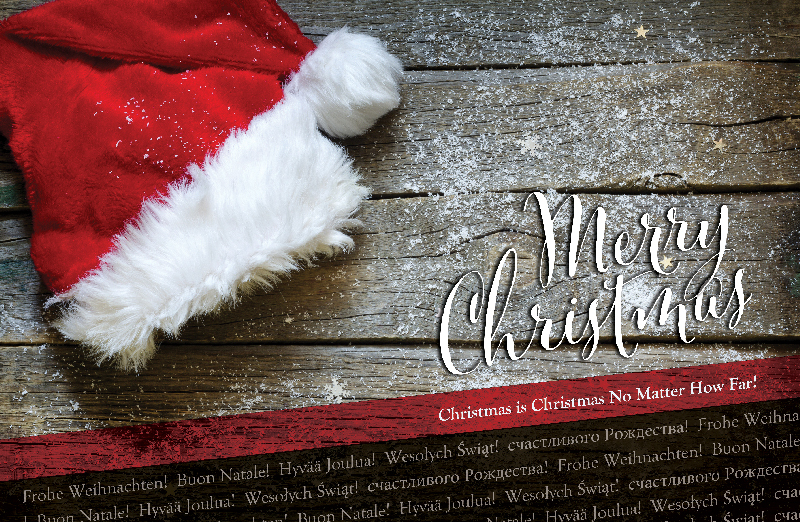 The author expresses his great thanks and gratitude to those who agreed to be interviewed about their national and family Christmas traditions for this article: Kristina Koehler (Germany), Aino Kelle (Finland), Laura Castelli (Italy), and Emilie Mansfeld (Poland). Matthew E. Jackson is the father of five, a writer, an adjunct professor of religion, philosophy, and humanities at Strayer University, and Director of Client Services at Think Webstore.